The Coopered Tot: Why Rye... Exploring The Rebirth Of An American Spirit - Its Rise, Fall, And Revival From Prohibition Through Resurgence. Why Rye... Exploring The Rebirth Of An American Spirit - Its Rise, Fall, And Revival From Prohibition Through Resurgence. It's going to be a barn burner of a rye tasting on Friday, November 1st at the fabulous Morgan Library & Museum's Dining Room. I've been researching the fascinating history of rye whiskey in America and I'm going to share stories and anecdotes and a full and extensive flight of delicious rye whiskies as well as a deconstructed-make-your-own rye Manhattan cocktail. I guarantee there won't be a dry eye (or throat) in the house - and it will be quite a trick emerging from such a smorgasbord sober. 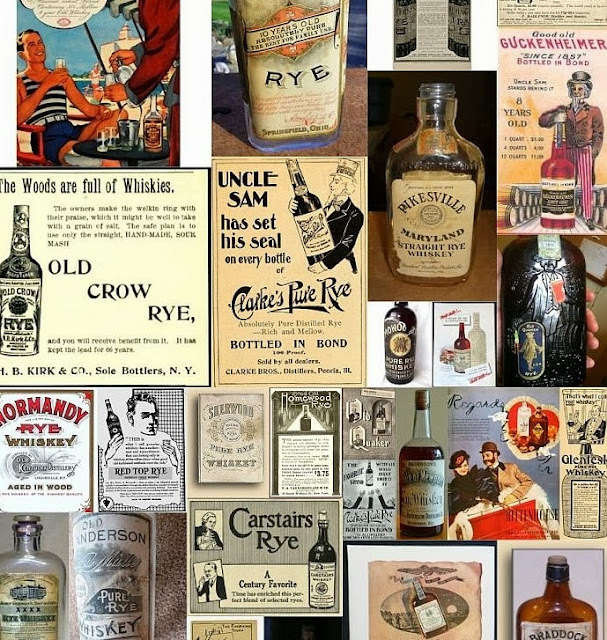 Rye is the original whiskey of America. Brought by central European settlers from Germany, France, Holland, and the like, rye was a hardy grain that grew well in the climate of the Northeast and central Atlantic States. It's what George Washington was distilling at Mt. Vernon in the 18th century. It was the whiskey that dominated the tastes and the 18th and 19th century markets of Massachusetts, New York, Maryland, Pennsylvania, Ohio, Indiana, and Illinois. Sweet and herbal with a mouth filling spicy and bitters kick - rye is the most fully flavored distilled spirit by a country mile. Its unique flavor signature was the quintessential American whiskey flavor and the mainstay of early mixed potables from Rock and Rye through the Rye Old Fashioned and Rye Manhattan (the original forms of these venerable drinks). Whiskey production ceased entirely in rye's old strong holds of Pennsylvania and Maryland in the period of whiskey's post-Mad Men era's fall from grace. Only a few brands of rye hung on in limited availability, produced only in Kentucky and Indiana and forgotten by most consumers. 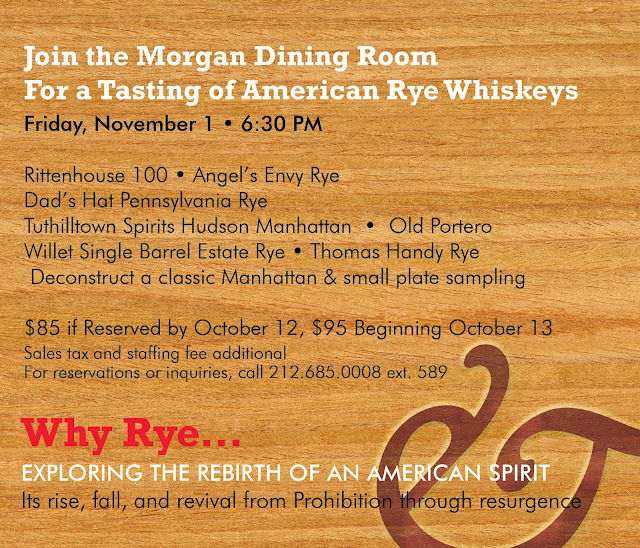 But, like whiskey in general in the past 15 years or so, rye is has re-surged, like a phoenix rising from the ashes. Broadly, as a culture, America was embracing rich flavors again and rejecting the "wonderbread" aesthetic in American food and drink. As American palates turned from light, thin, beers like Bud to rich and bitter imported and craft beers, the palate preferences in the whiskey world were bound to reignite for rye. All the same flavor elements that make rich beer delight the senses are at play in rye - and then some. The number of rye whiskies available has exploded and rye has resumed its rightful place neat in the snifters of Americans and in the heart of American whiskey cocktails. It's something to celebrate and enjoy. Rye whisky has a special place in the history of New York - and a special significance for J.P. Morgan who loved the Manhattan. How special it is to discuss this history and enjoy these flavors in Jack Morgan's dining room. ...and some unannounced specials as well. Also includes the deconstructed ingredients of the Manhattan cocktail for assembly and experimentation, and a small plate sampling accompaniment. $85 if reserved by October 12, $95 beginning October 13th. So sorry to learn this was canceled due to lack of interest...don't know what folks were thinking! Hope you'll try again some other time. The chocolate-whiskey pairing you ran previously was a knockout.